It’s an exiting time for us, though it has been a slow year in the development for the v3.90 release (a v4 preview). As some of you know, some of you might not know, the reason for the release of v3.90 is so that we could get new features to you sooner rather than later. In order to do we have had to trim some of the planned features but don’t fret, those features will be heading your way eventually in the v4.00 release. The developers have worked hard this month, and will continue to do so, perhaps the beta will come sometime by the end of this month? Here’s a tip for you, follow the roadmap for the v3.90 release and you’ll be able to track progress. At the time of the writing we’re almost at 60% done. Something new, is that a developer day has been introduced. 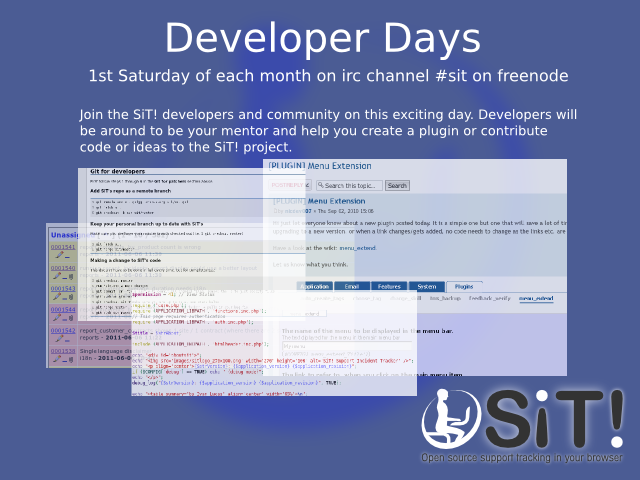 The developer day is a day where developers meet in on IRC (#sit on freenode) to, amongst other things; discuss issues, code, brainstorm ideas, mentor SiT hackers & plugin programmers and whom ever wants to contribute to SiT, and in general have an enjoyable day with everyone on IRC, everyone who is interested is welcome of course. The day in mention will be the first Saturday of every month, we are a friendly bunch and we don’t bite. Several plugins have been updated since the last news update, so why don’t you check out our plugins repository? I’d also say a thank you to José Tomás who has helped us with the Portuguese (Portugal) translations and a special thank you to Rob Beckett (aka subwolf) who made his first code contributions to SiT! this week after a sabbatical due to illness, Rob has long been a regular contributor to the fun we have on IRC. The day has come for the release of SiT! v3.63. This version has been long underway, but though there have been some bug fixes, and almost no new features this version is really recommended due to the fact that it fixes alot of security issues some found by Knud Erik from nSense, and some found by autosectools.com John Leitch & Bryce Darling. Next release will be the v3.90 which will be a pre v4.0 release which we decided to call v3.90 as it doesn’t contain all the features we want for 4.0.